The development follows the successful transformation of the village retail precinct in 2017 into a thriving hub of bars, eateries, boutique shopping and service stores, anchored by Farro Fresh and Kings Plant Barn. Developers Equinox Group will build The Peninsula on the northern edge of the site, right on the water’s edge, where Kings Plant Barn was formerly located. The nine-level development, which is being marketed for sale by Colliers International, will offer residences of between 150sq m to 660sq m including covered lanais and balconies. Pete Evans, National Director of Residential Project Marketing at Colliers International, says it will be the most exclusive waterfront residential community in Auckland. “No other apartment development in Auckland can match The Peninsula’s unrivalled waterfront location,” he says. 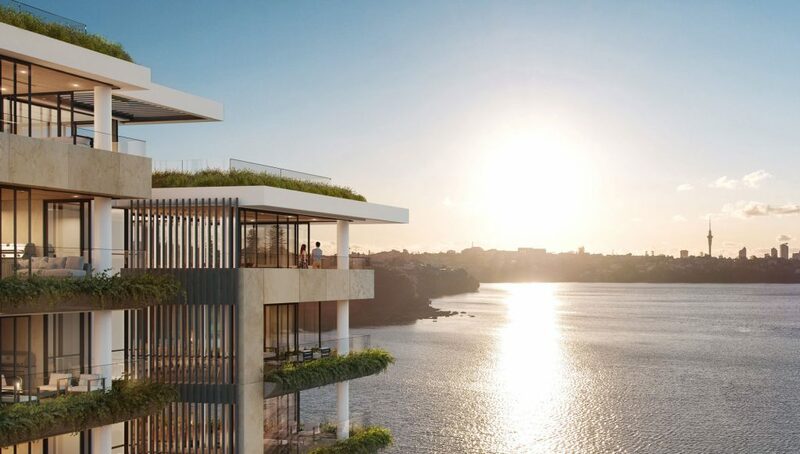 “The Peninsula’s private residences and penthouses will offer sweeping, uninterrupted views across Hobson Bay towards the city’s dynamic skyline and out across the Waitemata Harbour. “Resort-like amenity includes a wet-edge pool, cabana, yoga/pilates studio, bike and paddle board storage, greenhouse and potting area. “At the doorstep is the boutique shopping and dining of Orakei Bay Village as well as a walking bridge to the adjacent Orakei Train Station, offering access to the CBD and ferry terminal in less than 10 minutes. Equinox Group first started planning an apartment development on the site at 228-246 Orakei Road in 2006. However, the development had to be put on hold in 2015 after issues with Auckland Council and Auckland Transport made funding of the project not possible. Equinox Group Director Kerry Knight says the new plans have been significantly scaled back to remove the complexities of the previous requirement for development over the train tracks and a land swap with council. “We are now only building on our freehold land and The Peninsula is the premier waterfront location for residents in Orakei Bay Village. Knight says that with resource consent granted for the project The Peninsula is now for sale with construction due to get underway next year. “We’re excited to build on the success of the Orakei Bay Village retail precinct and we’re now focussed on developing The Peninsula, before continuing to unlock the potential of this unique site,” Knight says. Interested parties who want to find out more about The Peninsula development are encouraged to contact Colliers International.